Bullengarook slate quarry is going to be a disappointment to anyone expecting a sport climber's paradise. The brittle rock, dodgy bolts, and short, limited, and generally uninspiring routes are not going to appeal to all. However, it does have two or three fun lines in the grades 17 to 19 range, and being reasonably close to the highway, makes a nice little stop over on your way to, or home from some other, more deserving location. The area has a similar feel as Meredith's Oxbow Rocks, except that it's bolted rather than trad, and the access is easier. The rock itself is about 15m high, shale-like slate, on less than vertical slab, with most of the climbing on small edges, side pulling seams, and high stepping. Leave the trad rack in the car, unless you're going to thread the hanger-less bolts with wires. (Bring a spanner for the nuts?). Update: "Because of the dubious nature of the rock at this crag I recommend top-roping only off the good trees located on the top of cliff. If you are feeling bold then try leading the routes - but don't trust any of the bolts - even my new ones. Avoid using the rap anchors. .... I decided to re-bolt the route left of Night Train which is called Live and Let Die and is ungraded in my guide. It was around grade 18..." - Neil Monteith 21/6/2003. See: Full Report. Above Right: The Quarry. Kent re-rigging the anchor chains for a retrievable abseil after seconding my lead of Night Train, grade 19. To get to Bullengarook Quarry, travel 7.5kms out of Gisborne heading towards Bacchus Marsh. (See: approach map). Turn right onto "Hassed" road at the small berg of Bullengarook. After 1km head left onto "Webb" road for 300m then right down "Fitzgerald". After another 1km find the 4 wheel drive track leading into the bush on the right, just at the edge of some paddocks. Park the family sedan here, or a little ways down the track. After about 500m you'll hit a clearing. Stay on the rightmost track, cross a small creek, and there it is, the quarry face, peeking out from behind some trees. The immediate impression of the quarry face is that it's not as wide as you'd expect from the picture in the VCC's Northwest Victoria guide. The bolts (see examples, pictured below), are pretty ordinary to say the least, putting the safety of many of the routes in question. However, at least two of the lines, "Night Train" (19) and "Appetite For Destruction" (18) seem to have slightly better quality both in terms of the hardware and the moves, though still don't trust your life with any of the fixed gear. Above Left: Example of the questionable, rusted old bolts on many of the routes. Presumably you'd have to unscrew the nuts to dress the route with hangers before climbing. Above Right: Better bolts, with fixed chain links to clip, exist on "Night Train" (19) and "Appetite For Destruction" (18). Some of the routes, such as "Welcome to the Jungle" (17), which leads up near an arête, sport ancient, rusted home made fixed hangers. 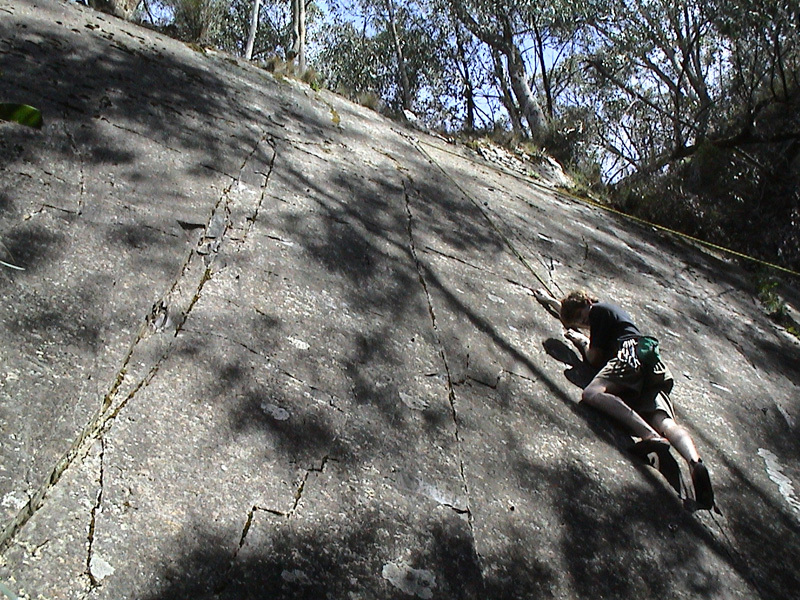 This line, and possibly the variation just right of it, look more appealing than the routes in the centre of the cliff, which are overshadowed by a tree and contain hanger-less old bolts (pictured above left). Right: Kent seconding my lead of "Night Train", grade 19. The pick of the routes, as far as we were concerned was "Night Train" at grade 19, and it's neighbour "Appetite For Destruction" at grade 18 on the right side of the crag. The later route is the more sustained of the two. "Night Train" might have a couple of grade 19 moves, but being a slab it contains several no hands rests. Combine this with the 5 closely spaced bolts and you've got a low stress lead, actually very enjoyable. Both lines terminate at double bolt anchors with fixed chains, useful for lowering off after a lead. We feel that these two routes redeem the area somewhat making it worth the trip, if it's not too far out of your way. Above: Adrian leading "Appetite For Destruction", grade 18. See the video clip (1.3 Meg, 20 seconds) for a very brief look at the standard "high step on edge" moves required. Unfortunately the tape ran out before he finished, but the footage should at least give you an idea of the slab. Fear not the Ute driving, beer swilling, ACDC fans and their motorbikes and dogs. These are just the local inhabitants in their natural environment. In summary, if you can overlook the bad points and just want to tick two or three short bolted slab climbs on your way home, because you got too cold at Camel's Hump or whatever, well you're in luck, Bullengarook quarry should fit the bill. Live And Let Die 3 bolts ? Northwest Victoria, A Rockclimbers Guide - A climbing guide book, edited by Chris Watson, Bill Andrews and Michael Hampton and available from local climbing shops, or the VCC. Chockstone Forum Topic - Discussion about the area on the Chockstone forum. Bullengarook Quarry - Single paragraph description from the rockclimbing.com site.